SPENCER, Mass. 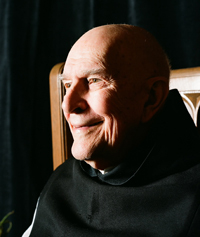 (CNS) — A funeral Mass will be celebrated Nov. 3 at St. Joseph’s Abbey in Spencer for Trappist Father Thomas Keating, a leading figure in the centering prayer movement that got its start in the 1970s. He died Oct. 25 at the abbey. He had been abbot there for two decades in the 1960s and 1970s. Father Keating was 95 and, according to his nephew, Peter Jones, had been in poor health for a number of years. Pledging to God to become a priest if he survived a serious illness he had in childhood, Joseph Parker Kirlin Keating, the son and grandson of maritime lawyers, entered the Cistercians’ Monastery Our Lady of the Valley in Valley Falls, Rhode Island, in 1944 and was ordained a priest in 1949. He took the name Thomas due to his admiration of St. Thomas Aquinas. After the Rhode Island monastery burned down in 1950, the monks moved to the Spencer monastery. Father Keating stayed there until he was invited to help establish a new monastery in Snowmass, Colorado. He stayed until 1961, when he was elected abbot at St. Joseph’s. He turned to centering prayer — a technique of praying silently to God without words — based on the encouragement issued by St. Paul VI during the Second Vatican Council to rediscover the contemplative tradition. Father Keating returned to Snowmass and helped found Contemplative Outreach for centering prayer practitioners in 1984, serving as its president 1985-99. The irony for the Trappist is that, to promote centering prayer, he left the confines of the monastery to speak at conferences worldwide. “People are feeling a deeper desire for prayer and the structure to support it,” he said in Omaha in 1990. Several of his books made the Catholic best-seller lists, including “Journey to the Center,” “Invitation to Love,” “Open Mind, Open Heart.” The latter was translated into Spanish, and “Invitacian a Amar” was a Spanish-language Catholic best-seller in 2005. It was from reading the priest’s “Open Mind, Open Heart” that a California man, Mike Kelley, decided he wanted to share centering prayer with the inmates at Folsom Prison. Paul, one of the “lifers” at Folsom, recalled the day Kelley came to talk to the men about centering prayer as “an answer to one of our prayers.” Hundreds of Folsom inmates took centering prayer classes from him. He described in 2001 how one gets started in centering prayer. “The great battle in the early stages of contemplative prayer is with thoughts,” he wrote. “It is unrealistic to aim at having no thoughts.